Technical analysis is the analytical method which uses mathematics, statistics, and probability theory to evaluate the relevant information and convert it to results. The good technical analysts not only have to be smart observers but also have to understand human psychology (how people think). They also have to remember the price movements at each given situation because “history can and does repeat itself”. This is where we consider the “pattern”. So, if you can control the feeling between “greed and fear” you can survive in this game. Although challenging, Technical Analysis is not as hard as you might think. Because we have tools to formulate the changes from the Price at Open, Close, High, Low, Change, and Volume from each period to give us tools as “indicators”. The Indicator can help you to understand the “Supply and Demand” and also whether a stock or index is “Overbought or Oversold”. This information can be used as an indicator to predict what will happen in the near future. When a stock has no “Demand” the price will always go down because everybody will want to sell. The indicator may show a time of being “Oversold”. That means no person will want to sell anymore. Now is the time to buy. So, Technical Analysis can help you in timing when to buy and when to sell to make profit or to cut your loss. It can even help you to predict when it’s time to walk away from the market entirely. 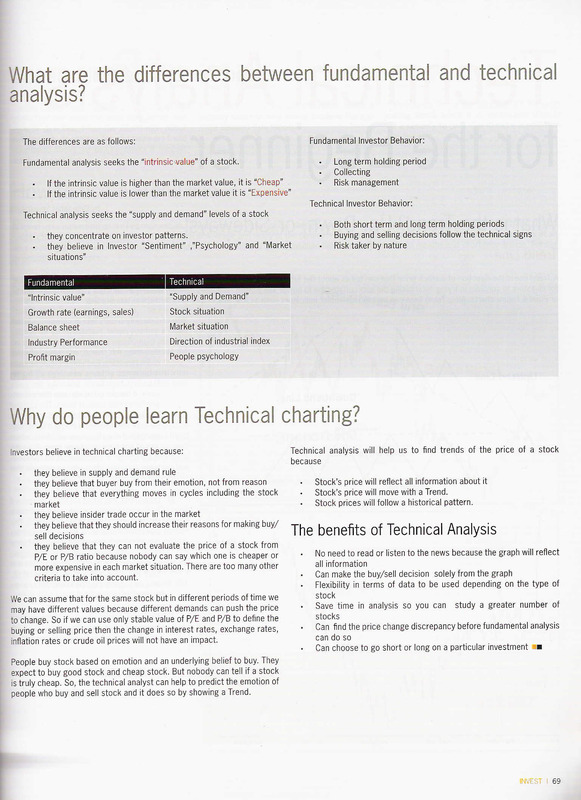 What’s type of investor can do technical analysis? Many investors may confuse themselves as to which type of investment discipline is best for them to succeed in the Stock Market. Some investors believe in fundamental analysis and some believe in technical analysis. Both types have their pros and cons. For example, in fundamental analysis they believe in “intrinsic value” or the present value of a firm’s expected future net cash flows discounted by the required rate of return. But fundamental analysis fails to tell us when is the appropriate time to enter or exit the market. On the other hand technical analysis focuses on supply and demand of a stock or index at a given time to help predict the buying and selling signals to achieve maximum gain. It fails to analyze the underlying company’s fiscal health. 1. A Fashion product: they will have characteristics of high liquidity and wide price fluctuations. The price depends largely on supply and demand in the short term. These products may become obsolete over time. Such products include clothing, computers, communication equipment, etc. 2. A Utility product: this is a product we use in normal daily life, sometimes called a consumer product. It has low margins and is purchased and sold in large quantities by wholesalers. The thing that we are concerned with here is liquidity. An example of this product is soap. 3. A Unique product: this product has value for the person who understands the product well. Sometime, they will have no liquidity at all but investors are willing to hold it for its collectible value. The price is also dependent on the opinions of the buyer and seller. Examples include antiques, stamps, and artwork. 1. Fashion product: this investor must predict the needs of the market and be attuned to market situations; they should be a risk taker; make fast decisions because the market changes very quickly. As prices fluctuate, the investor can be a speculator and there is profit to be made. 2. Utility product: this type of investor may not spend as much time tracking the market as frequently as the fashion type. They focus on the liquidity of the stock so he focuses on the volume of the stock traded. We can conclude that this investor is more conservative than the Fashion product investor. 3. Unique product: this investor will concentrate on the real value of the product and the can hold it for a long period of time. They may collect more and more of this product. They will sell if they can get their desired price. We call this type of investor a “value investor”. So from these comparisons the investor should have some concept in their minds as to what type of investor they are so they can manage their portfolios effectively. What are the differences between fundamental and technical analysis? Fundamental analysis seeks the “intrinsic value” of a stock. - they concentrate on investor patterns.